Kontrollerer arbeidet med å få reist #trollpikken Ok ? Last month, unknown vandals snuck up to Trollpikken and drilled a number of holes into the rock. The holes made the structure too weak to support, and it broke off. The damage was discovered on the morning of June 24 by a jogger. But thankfully, all was not lost. As the news spread throughout Norway, Odd Stangeland, Mayor of Eigersund received a call from Sverre Garpestad. Garpestad was a local contractor who said he could reattach it. Sadly, this would cost quite a bit of money — about 200,000 Krone, or roughly $23,600 USD. But Norwegian citizens heard the call to help out and set up a crowdfunding campaign. Not only did the campaign reach its goal, they beat it. They added an extra 28,000 Krone on top of the goal. And, thus, about two weeks later, Trollpikken was back to all its former glory. If you’re wondering how they did it, it was quite a lot of work. After all, the formation weighs about 12 tons. 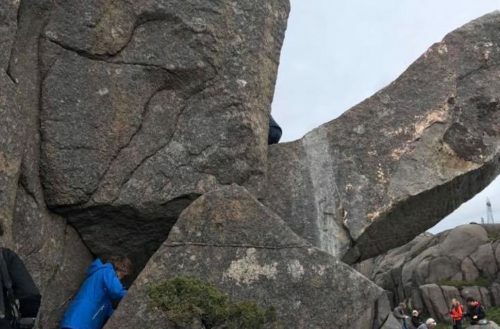 Workers used helicopters to lift the rock, and reattached it with bolts and mortar. The operation was a success — though you can now see the seam where the rock was reattached. Don’t worry, Trollpikken! Scars give character. Sadly, the person or people who committed this dastardly act of castration have not been found. That said, damaging rock formations in Norway carries a sentence of up to six years in prison. And, unfortunately, until we know who did it, their motives will remain a mystery.